Bank of America is a major player in the banking industry and the same goes for the Merchant Services industry. 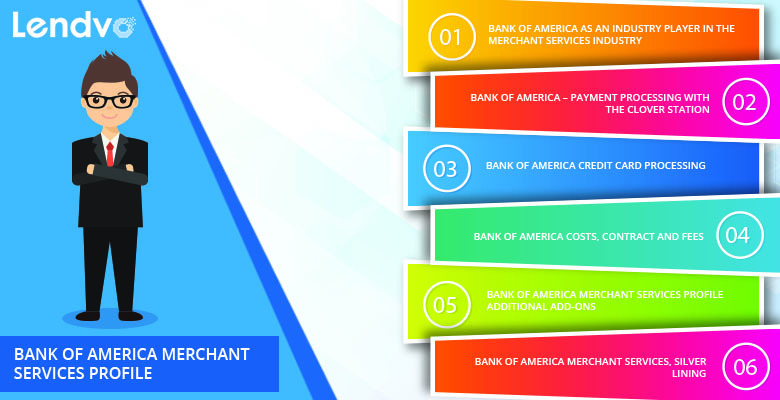 Bank of America is commonly referred to in the industry of merchant account providers, also known as the merchant services industry, as Bank of America Merchant Services or BAMS. Bank of America’s online presence has improved over recent years with a more easy to navigate interface as well as a better mobile pay solution that they have dubbed Bank of America Merchant Services Mobile Pay. The company used for their payment processing solutions is First Data and they are a reputable name in the industry. Bank of America is one of the largest banks in the U.S reporting between $300 and $400 billion in credit card transations for its merchant service industry clients. Bank of America uses the Clover Station for its small business owners as an all-in-one POS (point-of-sale) solution that makes business management for its customers a seamless, easy to use solution in their Bank of America Merchants Services division. The Clover Station offers support 24 hours a day, 7 days a week and 365 days a year. The business information is accessible from anywhere allowing its customers to check their current sales, pricing and an array of other items from mobile devices, on a business lunch or while at home. The station uses EMV-compliant card transactions to take payments, assess inventory, keep a tab on your sales and customize a variety of business additions while on the go. Customers say it has help increased sales and is easy to use. Fees hover around $1,264 to buy the entire system. To lease the Clover Station, you will pay around $63.53 per month so if you are in it for the long run, purchasing and owning the device seems to be more beneficial. Add-ons are included with purchase from First Data as they own the Clover product. Service fees are $50 per month then if you want to acquire another Clover Station as a store owner, fees are $25.00 per month. The fees for the additional assets that come with the Clover Station are $396.00 for a kitchen printer or monthly fees of $18.96 for a 36-month lease. The Kitchen Printer Cable (which you will need if you purchase the Kitchen Printer) is a one-time fee of $6.54 with no leasing option. The Clover Station has additional perks of allowing merchants to accept payments, manage inventory and track employee time. FD40 equipment is required to accept EMV and Apple Pay transactions, but with Apple Pay transactions becoming more commonplace, it is a plus they accept them. The Clover Station marketplace allows for advanced capabilities with appls under the Clover Station App to be used with your POS system. The hardware has a very sleek interface that makes it easy to use for merchants and customers; it also comes with a swivel stand, build in card reader, printer cables and paper, a matching cashdrawer – that fits in quite seemlessly with the swivel stand . Fast printing receipt paper will makes handling your business the only thing you need to focus on. Even if internet connection goes out, merchants are still able to check up on things going on with their business and the Clover Station including tracking sales, managing employees and tracking inventory. You can feel secure when using Bank of America’s Merchant Services because the security system is in line with the very secure one that Bank of America uses. All transactions that run through your Clover Station or Bank of America Mobile Pay are encrypted allowing the confidence of the merchant to flow through to the client. All data, including credit card information, transactions, employee managemnt, accounting for sales and so forth is protected by Bank of America’s data security. Bank of America Credit Card processing is one of the main perks of BAMS because as a big bank they are able to afford the most high quality services on the market. The merchant services benefits accept Visa, MasterCard, American Express and Discover Card. Funds that are deposited into your business account are accessible the next day and this is definitely a plus as many other merchant service solutions take more than a day to clear. Their customer support is the same as the banks and is available on a 24/7 basis with a front-end authorization system with an uptime nearing 100%. Electronic payments can be accepted by Bank of America Merchant services at all times anywhere. Scanning equipment will allow you to process e-checks and regular checks with purchases of add-ons. Bank of America does not simply disclose its fees on its websites, but after doing some research, we determined that depending on the buiness type of a given merchant, costs will vary business to business. The relationship your sales representative has with Bank of America and their negotiation skills can lead to differences in costs and fees for your business. The most common contract Bank of America puts in place for business users is a contract that lasts three years, or 36 months that charges customers $495 for terminataing the contract early, also known as an Early Termination Fee or an ETF. The PCI Compliance fee is a $95 annual fee. Equipment lease terms typically begin at 48 months and merchants are not allowed to cancel this fee. We advise to review any agreement carefully as numbers and fees may change based on the conduct of your business. The Clover Go replaced Bank of America’s own mobile pay system and fees come in at 2.7% per swipe or 3.5% per swipe with a $0.15 per each keyed transation. Card transaction fees are between 1.89% and 2.50%. Rates for $4,999.99 or less are 2.50%, for $5,000-$9,999.99 transactions are 2.30%, $10,000.00-$24,999.99 are 2.05% and $25,000.00 or more are 1.89%. Additional rate fees are 1.1% for non-swiped and non-dipped monthly dollar volume. American Express rates differ from those above with an additional 0.40% rate for cards issued outside of the U.S business landscape of retail, restaurants, travel agencies etc. Fraud FlexDetect can help you eliminate difficulties and dangers you may face as a small business owner accepted transactions without credit cards present, also known as card-not-present (CNP) transactions. This is a top-of-the line soluction which analyzes the risk level of all transaction data during the authorization process. Reports, chargeback details and performance review are available also. Geolocatin, device finterprinting, email address profiling, link analysis are all available and you can adjust the rules whenever you deem necessary. Bank of America has begun to assist its customers with different payment options in addition to offering ecommerce support and help building websites to work in tandem with Clover. A big bank making this effort is definitely a plus. Payroll distribution is offered electronically by Bank of America which allows for a reduction of payroll administration costs. The employer services number is available 7am-7pm CST or on email; it is available at all hours of the week for current cardholders and the services are accepted for all checks and cards. Bank of America Mobile Pay is also available from Bank of America Merchant Services members as mentioned. This is essential as so much business is being conducted online in the present day and with not all customers able to come into your store to use the Clover Station, you may find customers who are on the go looking to make purchases online. This is a major plus for us as we see more and more customers making purchases over the Internet and especially on their phone as we grow more and more in the digital era. Bank of America has begun to make itself more complicated over the years as the level of competition has risen in the merchant services market. Their Payment Network Compliance team is highly reputable and offers information and support in addition to monitoring of acconts. Additionally they offer advice on ecommerce and cybersecurity to small business owners on an as-needed basis. BAMS also allows merchants to accept debit and check cards in addition to credit cards. When applying for a BAMS account, you will need to complete an online form through Bank fo America’s website and this will trigger a customer service representative agent within BAMS to contact you within one business day. Payment Card Information is extremely important when it comes to conducting business dealing with credit cards and terminals. What this is is a variety of data secuirty requirements that the major credit card companies come up with to protect its customers and merchants from cybersecurity. In an era where sybersecurity issues are rising, the significans of PCI DSS is ever more important. Merchants must maintain compliance by completing the 12 PCI DSS requirements in 12 days. Levels will determine what level your business is in based on the number of transactions your business completes annually. Bank of America’s practice with EMV technology is one of the best in the business and they do a great job of protecting againt cyberbullies and counterfeit charges that other companies may faces based on the banks and technologies they are using, putting themselves in potential danger. EMV technology is essential because it means that in the world of conducting business online your credit card holders, your customers are protected when they are using your terminals to provide you with business and them with a product. While Bank of America is generally a reputable company responsible for most of the merchant credit card transactions in the United States, their rating has had some roadbumps because of customer reviews. Certain customers – small business and larger business owners – have complained of deceiving sales tacticts in addition to policies that were unclear or murky about topics such as early termination fees and service cancellation. There have been 6,165 complaints againd Bank of America in the last three years, yet they still hold a A+ BBB rating. Additionally, Bank of America’s sales agents and sales and marketing division has received a rating of a B because of its internal sales agents on ‘live chat’, on the phone and in sales meetings withholding what disclosure fees are. The terminal lease has been claimed unclear as well by some merchants not knowning the length. Essentials of the contract have been said by merchants to have been left out by Bank of America Merchang Services so we urge business owners to read the contract fully and in detail to avoid any miscommunications. With all factors taken into account, the relatively large fees from Bank of America Merchant Services and sales and marketing travails over the years have cause us to rate them with a 8.5 out of 10. They are still in the upper tier of the merchants services out there because at the end of the day the number of complaints they received in comparison; yet the majority of the complaints received where in the product/service complaints and billing/collection complaints categories which is a turn-off for us. Customer reviews we have found have been more positive than negative, yet we believe it is essential to note the complaints tha thave been received and which topics they are on so you can make sure that your business will not suffer from what they are doing wrong, but most importantly that your business will benefit from all of the positive innovation that is taking place at BAMS.We still recommend using Bank of America Merchant Services at the end of the day if you feel your business can handle the fees and minor issues.